Central Board of Secondary Education held Class 12 Hindi (Core) paper examination today as one of the first exams for Classes 10 and 12 since last week's paper leaks. 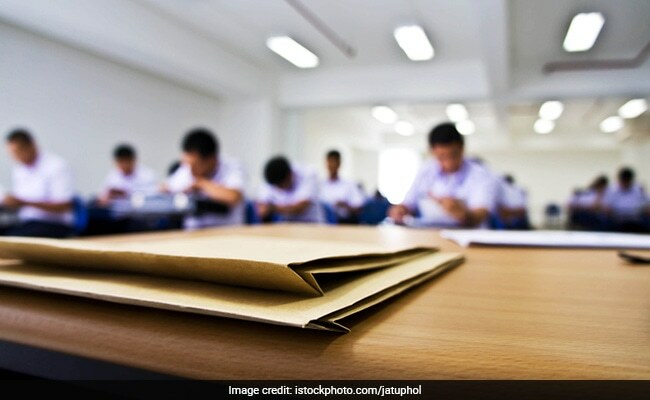 New Delhi: Central Board of Secondary Education held Class 12 Hindi (Core) paper examination today as one of the first exams for Classes 10 and 12 since last week's paper leaks. According an expert NDTV talked to, the paper was of average difficulty level. Maya Lohani, Hindi HOD, Army Public School Delhi Cantt. told us that the questions asked in today's class 12 Hindi paper was mostly based on the pattern prescribed by NCERT. Ms Lohani said in the Section A of the reading section was an average difficulty level. The students found the comprehensive poetry part was quite tough and it had some difficult language to comprehend. In Section B, according to the expert, the writing section had good scoring scope for the students. "All the topics of Article, Essay and Report Writing were relevant and associated with day today life. But letter writing question was a tricky one with indirect sender's clue," Ms Lohani added. She also said that in Section C of today's Hindi paper, the text book part had a combination of direct questions and a few unusual ones. The question-answer part was a mix bag and few questions were direct. In overall, the Ms Lohani told NDTV that the paper contains a balance of high ability thinking substance and some common questions. Meanwhile, the Human Resource Development (HRD) Ministry has advised parents and students not to rely on rumours and to inform the Central Board of Secondary Education (CBSE) if they come across any "hoax leaked papers" floated on social media. School Education Secretary Anil Swarup IAS in HRD said all efforts are being made to ensure smooth conduct of the exams today.